The Pacific Cubera Snapper, also known as the Pacific Dog Snapper, are the largest Snapper species in the Pacific and are second only to the Atlantic Cubera Snapper in size. They have a massive head with a massive girth and big menacing teeth. They are a very tough fish with large scales and thick bones. In some areas with lots of rocks they are almost impossible to land as they will bite and then head straight to the rocks. It doesn't matter what tackle you use in some areas; if they can get to the rocks without pulling drag then you have little hope. Pacific Cubera Snapper are one of my favorite species to fish for, as the pictures below suggest. They are very challenging to catch as they always head straight for whatever rocks are around and their initial run is tremendously powerful. 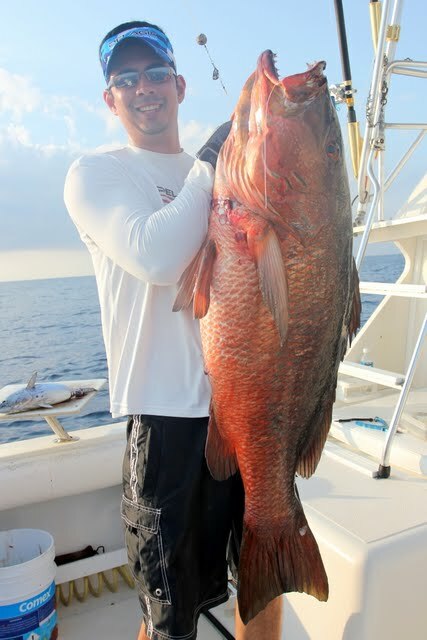 I have only seen one person pulled out of a boat by a fish and it was a 30lb Pacific Cubera Snapper. This is not a light tackle fish. If you try for the big ones on light tackle you are better off saving your gas money and just staying at the dock and throwing all your tackle into the ocean because you will basically get the same result. These things are extremely strong and always head for the rocks when hooked. I recommend braided line of at least 80lbs with a fluorocarbon leader of at least 80lbs. Wire would be nice to use but they won't bite it. Heavy conventional tackle is the way to go here. Personally I use the same tackle that I use for marlin and I don't feel like it's overkill. Lock the drag down. If something breaks, it breaks. Most of the time you will be able to turn the fish before anything breaks if you use good tackle and tie good knots. Find rocky structure in 150ft or less of water and look on the fish finder to see if anyone is home. The biggest ones come on live bait so just drop a bait down on a likely spot. Fish right off the bottom. If you are fishing with a lure then set the hook immediately and pull like crazy. If fishing bait you have to let them eat it a little longer. However, if you wait too long they will already be in the rocks. Iron jigs such as Salas 7x and other big metal jigs will work right off the bottom. I have caught them up to 35lbs this way. When they are found in reefs that rise up shallow you can throw big poppers to them which is a really fun way to fish. Large live fish make great baits. Live skipjack tuna are my favorite because when hooked they head straight down to were the snappers are. Very convenient. If you can't get live ones then you can use big chunks of fresh dead fish. I've caught some nice ones in the 70lb class in Panama. I also have had the fewest breakoffs in Panama in the Mariato area. Puerto Vallarta is also a very good place to get them. Baja has some but most spots are shallow and rocky and it is impossible to land the big ones unless you fish with very little line out. In which case they probably won't bite. They didn't get big by being dumb.